Conventional electronic biomolecular sensors use charge transfer across an electrically biased electrode-electrolyte interface as the detection mechanism. Specificity to a single analyte molecule is possible by functionalizing the electrode with an engineered protein. Over the past several years, research at Stanford [1,2] has introduced a new type of electronic biomolecular sensors, in which the interface is designed to transduce information about intra-molecular bond vibrational frequencies of non-redox active molecular species. This information can be observed in the tunneling current – voltage signature across the interface, if the sensor’s interface is designed to operate between the adiabatic and non-adiabatic charge-transfer regimes and if the current measured using an ultralow noise potentiostat. In this talk, I will start by describing the design guidelines of the nanoelectrochemical interface, which are derived from a circuit model based on a quantum mechanical analysis of the intermediate tunneling regime. For the initial demonstration of the nanoscale sensing interface, serial prototyping techniques (e.g., focused ion beam etching) were adopted. Current – voltage scans demonstrate the operating regimes of the interface and its ability to detect subtle differences in analytes, such as leucine and 2-d leucine (a single substitution of H with D). 1. C. Gupta, et al., J. Appl. Phys., 120, 224902 (2016). 2. C. Gupta, et al., J. Phys. Chem. C, 121, 15085–15105 (2017). 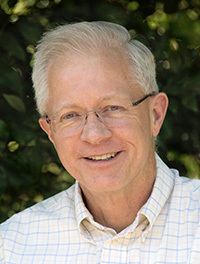 Roger T. Howe is the William E. Ayer Professor in the Dept. of Electrical Engineering at Stanford University. He received a B.S. in physics from Harvey Mudd College in 1979 and an M.S. and Ph.D. in electrical engineering from the University of California, Berkeley in 1981 and 1984. After faculty positions at CMU and MIT from 1984 – 1987, he returned to Berkeley where he was a Professor until 2005. His research group focuses on nano electromechanical system design and fabrication for a variety of applications. He was the Faculty Director of the Stanford Nanofabrication Facility from 2009 – 2017 was Director of the NSF’s National Nanotechnology Infrastructure Network (NNIN) from 2011 – 2015.